Newsletter: HOT TOPIC: Monetary Policy: Should Investors Fear the Fed? : HOT TOPIC: Monetary Policy: Should Investors Fear the Fed? Monetary Policy: Should Investors Fear the Fed? The Federal Reserve now faces the tricky task of loosening monetary policy enough to control inflation and keep the economy from overheating, but not so quickly as to reverse economic progress or upset financial markets. With the future health of the U.S. economy at stake, Wall Street will continue to pay close attention to the Fed’s deliberations, communications, and policy moves. The Federal Reserve System is the central bank of the United States. 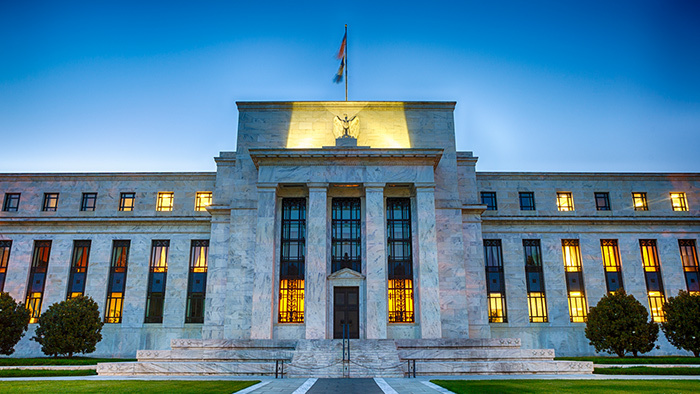 The Federal Open Market Committee (FOMC) is responsible for setting monetary policies in accordance with the Fed’s dual mandate to foster maximum employment and price stability. The FOMC typically meets eight times a year to discuss the outlook for the U.S. economy and make policy decisions. Seven members of the Board of Governors are appointed by the president and confirmed by the Senate to serve staggered 14-year terms intended to promote political independence. The Fed chair and vice-chair serve four-year terms and may be reappointed. President Trump selected Fed Governor Jerome Powell to succeed Janet Yellen as Federal Reserve chair in February 2018. Fed governors monitor domestic and international economic and financial conditions, lead committees that study current issues, meet with government organizations, and may be called to testify before Congress. The seven governors make up the voting majority of the FOMC, with the other five votes coming from the president of the Federal Reserve Bank of New York and four other Reserve Bank presidents, on a rotating basis. The federal funds rate is the interest rate at which banks lend funds to each other overnight to maintain legally required reserves. The FOMC sets a target range for the funds rate, with two specific rates that act as a floor and a ceiling to push the funds rate into that target range. The federal funds rate serves as a benchmark for many short-term rates set by banks and can influence longer-term rates as well. Adjusting the federal funds rate is one way the central bank influences interest rates, economic growth, and inflation. Theoretically, lowering rates fuels demand for credit and encourages consumers and businesses to spend and invest. Raising rates helps to slow economic activity when inflation is seen as the larger threat. When interest rates go up, the value of existing bond investments typically falls, which can adversely affect performance. But bonds still have an important role to play in many investors’ portfolios — namely to help moderate the effects of stock market volatility and portfolio risk. Equities may also be affected by rising rates, though not as directly as bonds. Widely expected Fed actions are often “priced into” markets before announcements are made, but surprises tend to have a more dramatic effect on prices. The financial markets may continue to react — and possibly overreact — as the Fed assesses economic data and makes critical decisions. But that doesn’t mean you should do the same. It’s important to keep a long-term perspective and make sound investment decisions based on your time horizon, risk tolerance, and financial goals. The return and principal value of stocks and bonds fluctuate with market conditions. Shares, when sold, and bonds redeemed prior to maturity may be worth more or less than their original cost. U.S. Treasuries are guaranteed by the U.S. government as to the timely payment of principal and interest. Advisory services offered through Blackridge Asset Management, a Registered Investment Advisor. Securities offered through Peak Brokerage Services, LLC, Member FINRA/SIPC Eisert Wealth Management and Blackridge Asset Management, LLC are independent and seperate entities from Peak Brokerage Services, LLC.